This is a re-post from years past. Many of my friends have made this, and just like I call my Grandmother every year for the recipe, they call me to get the recipe. Here it is. Enjoy and have a wonderful Thanksgiving! Every year, we have a few glasses of wine the night before Thanksgiving and call my Grandmother to ask for the dressing recipe. At my house, we call her the Kitchen Chemist. She has no recipes written down-all are in her head and every year the recipe is different, but somehow her dressing ALWAYS tastes the same. Go figure! After all of the years and the bottles of wine, this is the recipe that I use. I call it Holley House Dressing. There are some steps that are very important to follow according to the Kitchen Chemist, so pay close attention and do just what she says. And no kidding, my Grandmother is quite possibly (other that Paula Deen) the best cook in the WORLD. So here goes. Shopping list is at the end. You are gonna need about twelve pieces of chicken- can be breasts for salad later (which is what I do..) or a whole chicken. It doesn't matter if you use chicken toes, just make sure that however you can come up with 12 pieces of chicken..that is the magic number. EVERY YEAR, THAT NUMBER IS CONSISTENT. In a huge stock pot, boil the 12 pieces of chicken and 12 WYLERS chicken bullion cubes. Once the chicken is all done, set aside...and do whatever you are gonna do with it later. 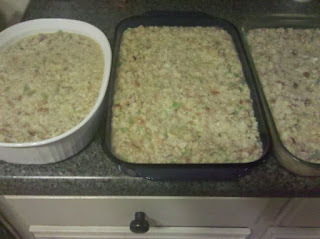 2 boxes of Stovetop Stuffing mix- MUST BE THE CHICKEN-the regular kind is not the same. You need to start with good cornbread or else it doesn't matter. Get Martha White Buttermilk Cornbread Mix. Follow the recipe for their cornbread EXCEPT...USE 3 EGGS INSTEAD OF ONE. BROWN EGGS ARE BETTER. When you are preparing your cornbread, to get good crust...put a little cooking oil (I use Olive Oil) in the bottom of the pan..and I use cake pans and so does Grand. You're gonna make two pans of cornbread, so that's two recipes according to the Martha White package. Do the math and know that's gonna be 6 EGGS for your cornbread. Put some oil in the bottom of the pan...enough to cover the bottom and have enough room to sprinkle corn meal and some salt in the bottom. Let the grease get good and hot, but not burn. Take out the pans and pour the corn bread batter into them. It will sizzle! That is how you know it is gonna be AWESOME. In a skillet, saute'e your finely chopped onions and celery in butter (until the onions are clear). Once your cornbread is done, get a HUGE mixing bowl and crumble your cornbread finely. 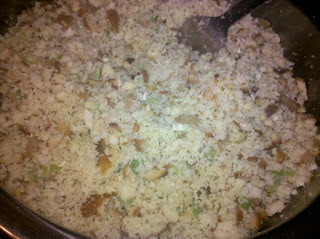 Add in your boxes of Stovetop- always mix dry with dry- then add your celery and onions. Now, you're going to pour in your chicken broth. You want it to be easy to mix- almost soupy, but not soupy if that makes sense. This should be the perfect amount of liquid if you don't overcook your chicken and let your broth evaporate, which is why it is important to watch the chicken. Once all of that is done, in a mixing bowl, beat 5 EGGS. Here is the trick to GOOD DRESSING. DO NOT JUST POUR THE BEATEN EGGS INTO THIS WARM OR HOT BATTER. You want to put about a teaspoon of the dressing into the beaten eggs and then add a little bit more to warm up the eggs. You want to make sure that they don't cook immediately when they hit the dressing. Then, mix the EGG/ DRESSING MIXTURE back into the dressing. Pour into the pans. You can put into the refrigerator overnight or even freeze at this point. Bake at 350 for 45min-1hr depending on your oven. Just check it and see if the corners are getting brown. You will be able to tell when it's done. Don't overcook it though or it will be dry. It is no joke, the best dressing ever..and comes out perfect every single time. Hope you enjoy it. If you make it, please share a note so I can tell my Grandmother you made her dressing, she'll be "just thrilled to hear" . ***SHE ALSO SAID THAT INSTEAD OF MAKING YOUR OWN BROTH...YOU CAN USE ABOUT 10 CUPS OF SWANSON BROTH. ***SHE ALSO SAID DO NOT...REPEAT DO NOT get the Cornbread stuffing...make sure it is CHICKEN STOVETOP or it "won't be fit to eat" ". My favorite thing about the holidays is polishing silver. Not because I'm a cleanie, mind you, because my friends will assure you that I certainly am not an ocd cleaner. However, I do love the accomplished feeling that I get when I know that the silver is sparkling, and I can see my own reflection in it. There is something about the anticipation of a holiday or special event that makes me all giddy knowing that the china and silver are ready for the table. When I was a little girl, Willie Fred, my family's housekeeper- let's just say Nanny, because she wasn't much of a housekeeper- would trick me into helping her polish the silver. She hated that job more than any other chore in the house. I would beg her to let me help, and she'd say "Chile, polishing silvah ain't no job for no little chile to be doing, you gotta know whatchoo doing, cause Miss Holley-she hard to please." I would beg and beg, and just like Tom Sawyer and his fence painting, she would let me help her polish. I can close my eyes and see Willie's gold tooth sparkle as she smiled watching me polish every single fork, knife, and spoon. And the trays, don't forget the trays! I felt so grown and full of purpose when I would climb up on the kitchen stool to reach the sink with the gooey, pink Wright's silver polish oozing out of the sponge that made my fingers chalky and nasty. I loved putting the knives and forks down into the warm water to reveal the untarnished silver and how the weight of it felt in my hand. I would dry and polish it with a soft cloth and put it on the table. Proud, I was so proud. I knew that one day, that silver would be on my table and I imagined the dinner parties I would have and the gowns I might wear. I watched a lot of soap operas as a child. My Grandmother's pattern is Strasbourg, my Mother's pattern is Strasbourg, and my pattern is Strasbourg. I married a man whose Mother's pattern is Strasbourg, as was his Grandmother's. I am probably the only one out of all of us who thinks about how that pattern connects us all. No matter which table is set before us, the Strasbourg is there- a reminder of holidays, special occasions from the past, and loved ones who have passed on to their reward. And just like our crazy drunk relatives that only come around during the holidays, our silver has been a constant. 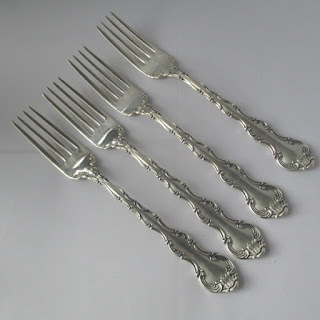 Some pieces might be missing, bent or dirty, but silver cleaning was and is always a reminder to me that no matter how nasty things can get- or how dirty the situation- a sponge, some love, and a little elbow grease can make everything brand new again.